AfriOceans Warriors Celebration – HUGE Success! Me with Mrs Williams and learners from Ocean View Special Needs School after receiving their certificates of participation of the AfriOceans Warriors Global Awareness Hike. Me with Mrs Williams and learners from Ocean View Special Needs School after receiving their certificates of participation of the AfriOceans Warriors Global Awareness Hike.Over 300 people braved rainy weather on the 6th May to be part of an action packed AfriOceans Warriors Celebration event held at Muizenberg High School. 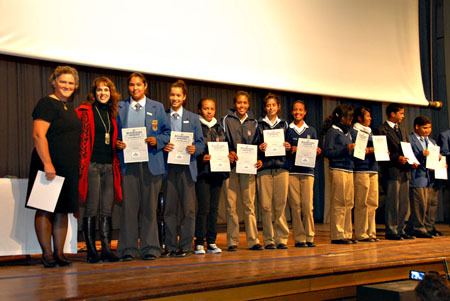 Learners and teachers representing 13 South Peninsula schools, including 14 NPOs, partners and sponsors (Reef, Brightweights, Pisces Diver, Reef, and Shark Lady Adventures), received certificates for participating in the historic AfriOceans Warriors Global Awareness Hike, which took place in December 2009. In order to acknowledge all participants of the hike, the AfriOceans Warriors Celebration was organised during which local music, fashion and the marine environment were showcased. The evening kicked off with Donovan Copley, leader of South Africa’s top band, Hot Water, accompanying learners modelling the new AfriOceans Warriors T-shirt range, sporting slogans like ‘Hot Chicks for a Cool Planet’ and ‘Think Global, Act Local’. 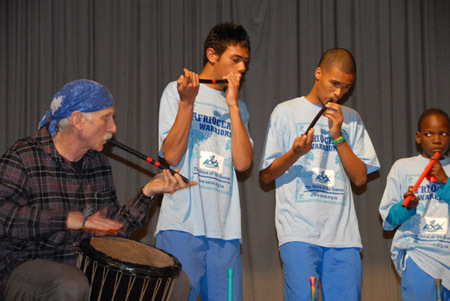 Dr Bruce Copley leading the Rainbow Warriors Vuvuzela EnsembleAnother highlight of the evening was the first performance of the AfriOceans Warriors Rainbow Vuvuzela ensemble, drawn from Muizenberg High school learners and led by Dr. Bruce Copley. This dynamic group aims to take the AfriOceans Warriors message to the world by performing at various fan-parks related to the FIFA World Cup. 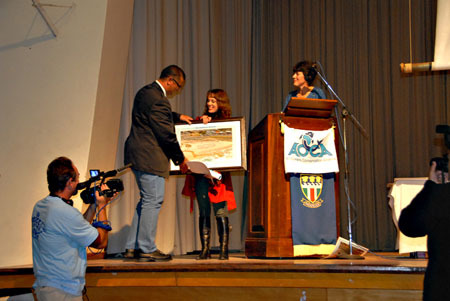 One of the founders of this innovative environmental education initiative, Deputy Principal of Muizenberg High, Leonie Jacobson, said that the AfriOceans Warriors represented the successful collaboration between education and communities. Learners from Muizenberg High School with the certificates against the backdrop of the wall in the hall decorated by the students.She explained that this year represented an exploratory phase for the Programme, with Muizenberg High school as the pilot project. 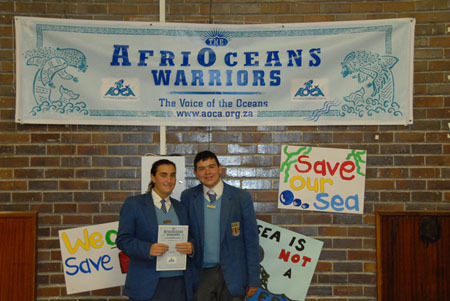 Already 80 young learners from the school had joined the first AfriOceans Warriors Tribe. Over the next three years, and dependent on funding, the programme aims to reach 170 schools along the South African coastline, targeting 170 000 school learners. 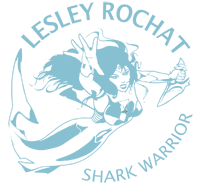 Head of Education of AOCA, Terry Corr, said it had been a dream realised to be part of creating this new vision for Environmental Education in South Africa, which took bold new steps in moving from Awareness to Action. He said that the AfriOceans Warriors Facebook group, set up a few weeks ago had just passed the 1000 member mark and he encouraged all those that wanted to be part of the project to join the group. 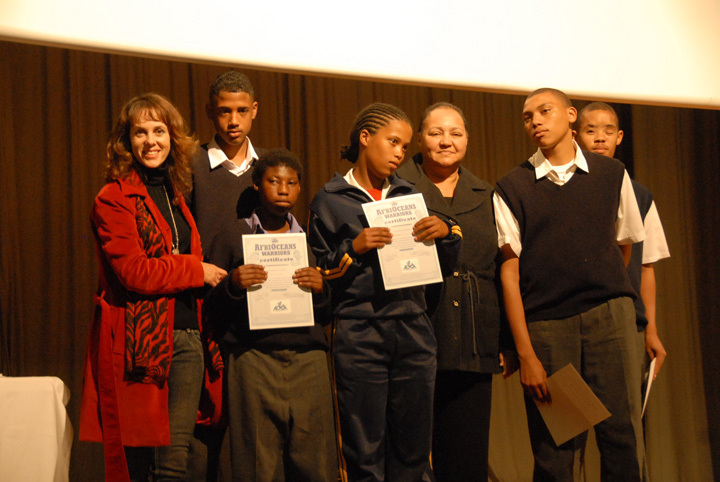 Mrs Lallette Mc Gillewie, and learners originally from Muizenburg Junior School proudly showing their certificates of participation. 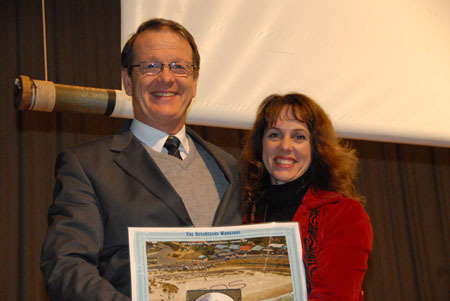 Mr Dave Shaw, Headmaster of Muizenberg High School with Lesley Rochat. Mr Juan Benjamin receiving a gift, a large photo of the SOS symbol the learners made. Learners from Muizenberg High School with the certificates against the backdrop of the wall in the hall decorated by the students. A special thanks goes to ALL our AfriOceans Warriors that participated in the hike last December – we are proud of you! And to everyone who helped us to make the event such a wonderful success, in particular Cape Point Vineyards who sponsored the lovely ‘Splattered Toad’ wine! THANK YOU! That is why we are here for, what we are fighting for, to make a change towards a better world for the sake of all the children, all future generations and for our still very beautiful planet. My great respect and support to you !